Hanoi (VNA) – The Ministry of Home Affairs (MoHA) held a meeting on August 29 to review a pilot project selecting 600 excellent young intellectuals to work as vice chairs of the communal People’s Committees in 64 poor districts nationwide. 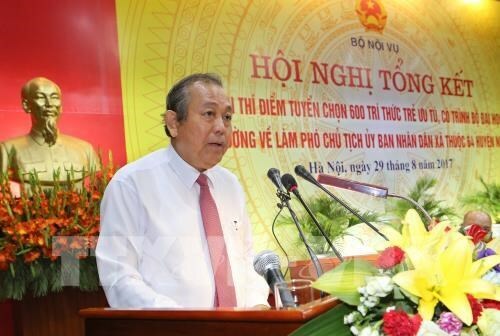 MoHA Deputy Minister Nguyen Trong Thua said in early October 2012, his ministry finished selecting 580 young persons with university diplomas for the project, which has been carried out in 20 provinces. They have made active contributions to building clean and strong grassroots political systems and directly engaging in local socio-economic development tasks, he noted, adding that the project has also helped fine-tune mechanisms and policies on discovering, selecting and training young officials in Vietnam. Over the last five years, 351 project members have proactively suggested and directly carried out 834 socio-economic development programmes, plans and projects. Thua cited a Ngoc Linh ginseng farming model initiated by Vice Chairman of the Tra Linh communal People’s Committee Dinh Hong Thang in Quang Nam province, saying this model has helped local residents escape from poverty. Meanwhile, a plan on building clean water supply system implemented by Vice Chairman of the Ba Dien communal People’s Committee Nguyen Anh Khoa in Quang Ngai province has helped curb skin diseases in the locality. Those programmes, plans and projects have helped raise local people’s income and awareness of socio-economic development, custom changes and cultural preservation, the official added. As of June 30 this year, 564 project members had been qualified for continuing the task after the project expires, but four of them did not want to continue working in the localities they used to serve. Up to 217 project members (or 38.7 percent) have been appointed as communal civil servants while 13 (2.3 percent) have been promoted to chairpersons of the communal People’s Committees. Seventeen members (3 percent) have been elected chairpersons of the communal women’s unions, Vietnam Fatherland Front committees and youth union committees. Sixty-eight others (12.1 percent) continue to serve as vice chairs of the communal People’s Committees. Another 148 project members in 26 districts of nine provinces haven’t been appointed to any positions, Thua said. Addressing the meeting, Deputy Prime Minister Truong Hoa Binh affirmed that the Party has consistently attached importance to the role of the youth. The project of 600 communal vice chairs shows the Party and Government’s trust in the young generation. He recognised the project members’ excellent performance in fulfilling assigned tasks, adding that the project has also created a chance for young intellectuals to improve themselves. He also pointed out certain shortcomings, including local administration’s lack of awareness of the project members’ role and long-term preparation of personnel for their localities. The Deputy PM asked the beneficiary localities to better use the young intellectuals after the project is over while working to encourage young people’s dedication.